Centurion Labz is currently the world leader in the production of dietary supplements for athletes. The Centurion Labz brand products are characterized by the highest quality and thoughtful composition with the care of using only effective doses of each ingredient. God Of Rage Reloaded is the third pre-training product from the series "RAGE" which guests in our offer. Just like the predecessors, Reloaded is a powerful pre-workout formula that combines as many as 16 ingredients, creating once more uncompromising product and at the same time extremely economical against the competition, already one measure God Of Rage guarantees an amazing experience during training, and the packaging lasts up to 33 workouts. The latest stimulants such as DMHA and Eria Jarensis were used to produce God of Rage Reloaded, which have already won the hearts of many users in the USA and Europe. Taste Cosmic Star Candy will appeal to even the most fastidious person, which makes the product without doubt one of the best in its category. L-Citrulline - Participates in the synthesis of nitric oxide (NO) and phosphocreatine and aerobic glucose metabolism, thereby increasing the uptake of oxygen, glucose, amino acids and creatine and energy production through muscle cells. It reduces the concentration of lactic acid and ammonia in the muscles, allowing the body to recover energy faster by increasing the level of creatine phosphate and resynthesis ATP. Citrulline malate is a much more effective form than high doses of arginine, as it is its precursor. At the same dose as arginine is more effective in increasing its amount in the body than arginine alone. Beta-Alanine - The main function of this amino acid is not to increase the volume of muscle cells, but to increase the level of carnosine in the muscles. Effect? Both during aerobic and anaerobic efforts, the process of acidifying skeletal muscles is significantly slowed down. In practice, this translates into heavier, more intense and more effective workouts. Both endurance as well as muscular strength are growing. Creatine Monohydrate - So a molecule of creatine combined with a molecule of water is the best studied form of creatine in terms of energy, strength and muscle mass. Taurine - Amino acid, whose particularly high concentrations are noted in highly-growing organisms. Affects cognitive abilities, it is often recommended as an effective form of support for learners. It improves mental functions, it also has a positive effect on the mood. The effectiveness of taurine in this field is so important that it is recommended as one of the means to eliminate discomfort caused by excessive alcohol consumption. Increased supply of taurine also promotes an efficient energy management of the body. This amino acid acts as a creatine transporter, which stimulates the acquisition of energy from phosphagen, a mechanism that prevails during strength, interval and sprint training. Anhydrous Caffeine - The most-known stimulant compound in the world. It has a stimulating effect, lowers the level of Adenosine, inhibits the breakdown of cAMP. Theobromine - By inhibiting the cAMP-degrading phosphodiesterase, it increases its concentration, thanks to which it affects the behavior of clarity of thinking and promotion of the lipolysis process, thanks to which it increases the pool of readily available energy substrate resources. Theobromine also affects the relaxation of blood vessels and lowering blood pressure. 2-Amino-6-methylheptane (DMHA) - Is a stimulant that has other names such as 2-aminoisoheptane or octodrine. DMHA has a relaxant effect on the bronchi, thanks to which our aerobic capacity increases, moreover it has decongestant activity (narrowing blood vessels, causing an increase in the oxygen flow rate), does not cause "stupor" and sharpens the senses that could not always be experienced with dmaa. Eria Jarensis - Works as a neuromodulator on the central nervous system, giving many benefits to cognitive functions. Provides effects that improve mood by increasing the level of dopamine and nor-adrenaline in the body. Dopamine is responsible for increasing the sense of well-being, and therefore the extract from Eria Jarensis provides a euphoric effect, and at the same time reduces the feeling of anxiety. Dopamine and noradrenaline are also associated with increased mental alertness and concentration. Mucuna Pruriens - Included in the product God Of Rage Reloaded is highly bioavailable for the brain, which easily and effectively increases the possibilities for the synthesis of dopamine. This astounding neurotransmitter is an extremely important element for the proper functioning of the nervous system and the flow of nerve signals. High levels of dopamine promote well-being after training, which is important when using strong stimulants. Choline Bitartrate - is used as a supplement that improves the efficiency of the body and memory. This agent is responsible for the production of Acetylcholine, which improves the memory and controls the increase in muscle mass. Choline Bitartrate also has properties that support liver regeneration in people who abuse drugs and alcohol. In people who use it reduces cholesterol, lowers blood pressure, prevents mood swings. Higenamine - Affects the production of nitric acid. Nitric acid affects the release of hormones and adrenaline. It is also certain that the product accelerates the time of regeneration of the body, and also increases the amount of blood flowing, and thus the amount of nutrients supplied to the muscles is much greater. Hordenine - This supplement works primarily through the release and protection of norepinephrine, which translates into increased metabolism, energy supply as well as a decrease in appetite. 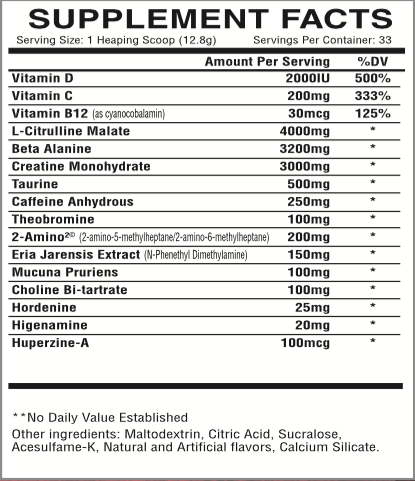 Users use Hordenine for three main effects: fat loss, appetite control and energy boost. It is used by bodybuilders before training, for synergistic effects combined with PEA (phenylethylamine). Huperzine-A - an alkaloid with the ability to penetrate the blood-brain barrier, which is a negative catalyst for the degradation of acetylcholine, improving nerve conduction and having a significant impact on concentration, association and memory. It helps to alleviate the effects of oxygen stress, prevents depression and has neuroprotective properties that improve well-being. In sports supplementation, it is recommended during pre-workout, pre-workout and during exercise, in order to improve concentration. 1 scoop 15-30 minutes before training.